jews and Judaism in China have had a long history. 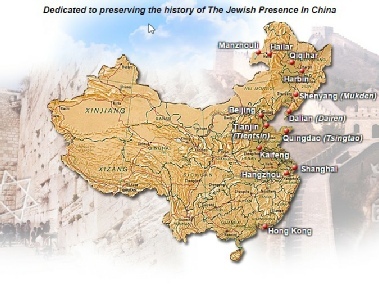 Jewish settlers are documented in China as early as the 7th or 8th century CE. Relatively isolated communities developed through the Tang and Song Dynasties (7th to 12th centuries CE) all the way through the Qing Dynasty (19th century), most notably in the Kaifeng Jews (the term "Chinese Jews" is often used in a restricted sense to refer to these communities). By the time of the establishment of the People's Republic of China in 1949, few if any native Chinese Jews were known to have maintained the practice of their religion and culture. .In the late 20th and early 21st centuries, however, some international Jewish groups have helped Chinese Jews rediscover their heritage. In the 19th and early 20th centuries, Jewish merchants from around the world began to trade in Chinese ports, particularly in the commercial centers of Hong Kong, which was for a time a British colony, Shanghai (the International Settlement and French Concession), and Harbin (the Trans-Siberian Railway). In the first half of the 20th century, thousands of Jewish refugees escaping from the 1917 Russian Revolution arrived in China. Later thousands escaping from the Germans arrived making Shanghai the biggest refugee centre in the world. The end of the war and the Chinese revolution saw nearly all leave. The change in the Chinese economy has seen a revival of the Jewish community. China That such groups (such as those in India) should survive at all testified not to the proselytizing power of Judaism but to its tenacious adaptability even in the most adverse circumstances. But it cannot be denied that the cataclysmic events of the twentieth century virtually destroyed dozens of Jewish communities, many of them ancient. The post war Communist regime in China, for instance, imposed its own final solution on China’s Jewish population, much of it a refugee exodus from Soviet Russia and Hitler’s Europe, but including descendant of Jews who had been in China from the eighth century onwards. All fled or were driven out, Hong Kong alone, with about 1,000 Jews and Singapore with 400, constituting lonely outposts in the Far East. China's Jewish communities have been ethnically diverse ranging from the Jews of Kaifeng and other places during the history of Imperial China, who, it is reported, came to be more or less totally assimilated into Chinese culture, to 19th- and 20th-century Ashkenazi Jews, to Baghdadis, to Indians. The presence of a community of Jewish immigrants in China is consistent with the history of the Jewish people during the first and second millennia CE, which saw them disperse and settle throughout the Eurasian landmass, with an especial concentration throughout central Asia. By the 9th century, ibn Khordadbeh noted the travels of Jewish merchants called Radhanites, whose trade took them to China via the Silk Road through Central Asia and India. Jacob of Ancona, the supposed author of a book of travels,was a scholarly Jewish merchant who wrote in vernacular Italian, and reached China in 1271, although some authors question it. Many more arrived as refugees from the Russian Revolution of 1917. A surge of Jews and Jewish families was to arrive in the late 1930s and 1940s, for the purpose of seeking refuge from the Holocaust in Europe and were predominantly of European origin. Shanghai was notable for its volume of Jewish refugees, most of whom left after the war, the rest relocating prior to or immediately after the establishment of the People's Republic of China. Over the centuries, the Kaifeng community came to be virtually indistinguishable from the Chinese population and is not recognized by the Chinese government as a separate ethnic minority. This is as a result of having adopted many Han Chinese customs including patrilineal descent, as well as extensive intermarriage with the local population. Since their religious practices are functionally extinct, they are not eligible for expedited immigration to Israel under the Law of Return unless they explicitly convert. Today, some descendants of the Jews still live in the Han Chinese and Hui population. Some of them, as well as international Jewish communities, are beginning to revive their interest in this heritage. This is especially important in modern China because belonging to any minority group includes a variety of benefits including reduced restrictions on the number of children and easier admission standards to tertiary education. The study of Judaism in China has been, like other Abrahamic religions, a subject of interest to some Westerners, and has achieved moderate success compared to other Western studies in China. The Kaifeng Jews are members of a small Jewish community in Kaifeng, in the Henan province of China who have assimilated into Chinese society while preserving some Jewish traditions and customs. Their origin and time of arrival in Kaifeng are a matter of debate among experts. Most scholars agree that a Jewish community has existed in Kaifeng since the Northern Song Dynasty (960–1127), though some date their arrival to the Tang Dynasty (618–907) or earlier. Kaifeng, then the capital of the Northern Song Dynasty, was a cosmopolitan city on a branch of the Silk Road. It is surmised that a small community of Jews, most likely from Persia or India, arrived either overland or by a sea route, and settled in the city, building a synagogue in 1163. During the Ming Dynasty (1368–1644), a Ming emperor conferred eight surnames upon the Jews, by which they are identifiable today: Ai, Shi, Gao, Gan, Jin, Li, Zhang, and Zhao. By the beginning of the 20th century one of these Kaifeng clans, the Zhang, had largely converted to Islam. The existence of Jews in China was unknown to Europeans until 1605, when Matteo Ricci, then established in Beijing, was visited by a Jew from Kaifeng, who had come to Beijing to take examinations for his jinshi degree. According to his account in De Christiana expeditione apud Sinas, his visitor, named Ai Tian (Ai T'ien; 艾田) explained that he worshipped one God. It is recorded that when he saw a Christian image of Mary with Jesus, he believed it to be a picture of Rebecca with Esau or Jacob. Ai said that many other Jews resided in Kaifeng; they had a splendid synagogue (礼拜寺 libai si) and possessed a great number of written materials and books. When Ricci wrote to the "ruler of the synagogue" in Kaifeng, telling him that the Messiah the Jews were waiting for had come already, the "Archsynagogus" wrote back, saying that the Messiah would not come for another ten thousand years. Nonetheless, apparently concerned with the lack of a trained successor, the old rabbi offered Ricci his position, if the Jesuit would join their faith and abstain from eating pork. Later, another three Jews from Kaifeng, including Ai's nephew, stopped by the Jesuits' house while visiting Beijing on business, and got themselves baptized. They told Ricci that the old rabbi had died, and (since Ricci had not taken up on his earlier offer), his position was inherited by his son, "quite unlearned in matters pertaining to his faith". Ricci's overall impression of the situation of China's Jewish community was that "they were well on the way to becoming Saracens [i.e., Muslims] or heathens."). The Taiping Rebellion of the 1850s led to the dispersal of the community, but it later returned to Kaifeng. Three stelae with inscriptions were found at Kaifeng. The oldest, dating from 1489, commemorates the construction of a synagogue in 1163 (bearing the name 清真寺, Qingzhen Si, a term often used for mosques in Chinese). The inscription states that the Jews came to China from India during the Han Dynasty period (2nd century BCE – 2nd century CE). It cites the names of 70 Jews with Chinese surnames, describes their audience with an unnamed Song Dynasty emperor, and lists the transmission of their religion from Abraham down to the prophet Ezra. The second tablet, dating from 1512 (found in the synagogue Xuanzhang Daojing Si) details their Jewish religious practices. The third, dated 1663, commemorates the rebuilding of the Qingzhen si synagogue and repeats information that appears in the other two stelae. Father Joseph Brucker, a Roman Catholic researcher of the early 20th century, notes that Ricci's account of Chinese Jews indicates that there were only in the range of ten or twelve Jewish families in Kaifeng in the late 16th to early 17th centuries, and that they had reportedly resided there for five or six hundred years. It was also stated in the manuscripts that there was a greater number of Jews in Hangzhou. This could be taken to suggest that loyal Jews fled south along with the soon-to-be crowned Emperor Gaozong to Hangzhou. In fact, the 1489 stele mentions how the Jews "abandoned Bianliang" (Kaifeng) after the Jingkang Incident. Despite their isolation from the rest of the Jewish diaspora, the Jews of Kaifeng preserved Jewish traditions and customs for many centuries. In the 17th century, assimilation began to erode these traditions. The rate of intermarriage between Jews and other ethnic groups, such as the Han Chinese, and the Hui and Manchu minorities in China, increased. The destruction of the synagogue in the 1860s led to the community's demise. However, JL Liebermann, the first Western Jew to visit Kaifeng in 1867, noted that "they still had a burial ground of their own". In 1868 it was reported that their liturgy consisted only of pieces from the Bible. SM Perlmann, the Shanghai businessman and scholar, wrote in 1912 that "they bury their dead in coffins, but of a different shape than those of the Chinese are made, and do not attire the dead in secular clothes as the Chinese do, but in linen"
Some descendants of Kaifeng's Jewish community say their parents and grandparents told them that they were Jewish and would one day "return to their land", others are only vaguely aware of their ancestry. The Kaifeng Jews intermarried with local Chinese sufficiently to be indistinguishable in appearance from their non-Jewish neighbors. One trait that differentiated them from their neighbors was not eating pork. Qu Yinan, a Chinese woman who discovered her Jewish ancestry after her mother attended a conference on minorities in 1981, says her family did not eat pork or shellfish and her grandfather always wore a blue skullcap. Within the framework of contemporary rabbinical Judaism, matrilineal transmission of Jewishness is predominant, while Chinese Jews based their Jewishness on patrilineal descent. As a result, in Israel they are required to undergo conversion in order to receive Israeli citizenship under the Law of Return. After contact with Jewish tourists, some of the Jews of Kaifeng have reconnected to mainstream Jewry. Recently a family of Kaifeng Jewish descendants formally converted to Judaism and accepted Israeli citizenship. Their experiences are described in the documentary film, Kaifeng, Jerusalem. On October 20, 2009, the first group of Kaifeng Jews arrived in Israel, in an aliyah operation coordinated by Shavei Israel. This combined version of my previous posts on this community was written for and is cross-posted to Beyond Victoriana. This post also contains some information not included in previous posts; this community is the subject of my MA thesis, so I will always have more to add. In fact, even re-reading this now I’m thinking “weeellll it was more complicated than that I mean…” but I think it’s long enough for now. If you would like me to, I can elaborate on anything in this post. Just ask. The only thing I cannot elaborate on is my argumentation, as it’s generally a bad idea to post such things online. I would just like to note for my Jewish readers that this post has been set to go live today since mid-March, and I did not realize the significance of today when that date was set. So, please be advised that this is not a Yom HaShoah post. In the wake of the mass arrests of Jewish men during Kristallnacht, it fell to these women to free their husbands—typically from Dachau. Nazi officials would not release men until their families provided proof that they would depart from Germany immediately upon their release. Thus, not only did women have to rescue their husbands, but they also had to navigate the emigration process by themselves. Due to the complex legal frameworks enacted by possible destination countries to keep Jewish refugees out, it was immensely difficult for Jews to secure visas out of Germany, made even more difficult when they were confronted with the massive exit tax forced on emigrating Jews. The journey to Shanghai began by train to an Italian port. From one of those ports, refugees aboard luxury liners serviced by German, and sometimes Japanese, crews sailed across the Mediterranean, through the Suez Canal, into the Indian Ocean, and around to the east coast of China. Their ship then made its way down the Whangpoo River until it docked at the Bund (Shanghai’s harbor-side financial district). This route was in use until Italy’s entrance into the war on June 10, 1940—although a few ships full of refugees did depart from Portugal and Marseilles before the Mediterranean was fully closed to passenger traffic. After the Mediterranean route closed, Jewish refugees fled to Shanghai via the trans-Siberian Railroad. This overland route took them across Russia, through Siberia, and into North China, where they boarded a ship for Shanghai. The overland route was in use until December 7, 1941. After that date, all escape routes to Shanghai were closed. Though I’ve focused on German and Austrian Jews, about 1,800 Polish-Lithuanian Jewish refugees—including a large population of yeshiva students—too found refuge in Shanghai. This population of yeshiva students and their families first fled to Vilna, and then to Kovno, Lithuania after the invasion of Poland. The Dutch and Japanese consuls in Kovno collaborated to grant the refugees visas to the Dutch Caribbean holding of Curacao; the trip to Curacao involved a stopover in Kobe, Japan. Both consuls were aware of the fact that it was not possible to cross the Atlantic during a time of open warfare, meaning that they illegally granted the refugees admittance into Japan. This group of refugees remained in Kobe until 1941, at which point the Japanese government sent them to Shanghai. The Dutch consul, Jan Zwartendijk, was later fired in disgrace, while the Japanese consul, Chiune Sugihara was merely asked to step down. Sugihara, who saved 10,000 Jews total and is listed by Yad Vashem as one of the Righteous Among the Nations, is typically perceived as the Oskar Schindler of the East. However, it is probable that his actions were merely in line with general Japanese policy towards the Jews, which will be expounded upon below. The first wave of refugees to arrive at the Bund in 1938 disembarked with little more to their names than the clothes on their backs, a suitcase or two, and the equivalent of about fifteen American dollars; Nazi policy forbade them to take much else out of the country. This poverty could be seen in each subsequent boat full of refugees. The visible poverty of these Jews embarrassed the established Russian and Sephardic Jewish communities of Shanghai; the Sephardic Jewish community was Baghdadi in origin, and had traveled to Shanghai as businessmen under the auspices of the British Empire, while the Russian Jewish community arrived in Shanghai in two main waves: first fleeing from the pogroms of 1905, and then from the violently anti-Semitic White Russian forces during the Russian Civil War. One year before the refugees began to arrive, hostilities of the Sino-Japanese War were waged in the streets of the Hongkew district of Shanghai, leading to its partial destruction. Because land and property in Hongkew were thus so inexpensive, and because of the destitution of the new arrivals, Jewish relief organizations in Allied and neutral countries along with the Sephardic and Russian communities in Shanghai—the Hardoon and Kadoorie families in particular—collaborated to set up refugee homes based in Hongkew for the refugees. These homes (Heime), though obviously better than nothing, were crowded, unsanitary, and the time spent there was extremely distressing for the formerly upper middle class refugees. While some refugees received money from relations in Allied or neutral countries, had smuggled money and/or valuables out of Germany, or had been able to quickly find gainful employment and relocate to the French or International Districts of Shanghai, many were never able to accumulate the funds needed to secure housing outside of Hongkew. Some, so traumatized by Kristallnacht, leaving Germany, and arriving with nothing to the Heime, so traumatized by their loss of identity, became depressed and never left their Heim; this was especially true for those who had held high status professions in Germany—such as professorships—which could not be adapted to the Shanghai setting. Conditions within Hongkew were deplorable, with the available housing insufficient to shield the residents from the extreme temperatures reached in the summer and winter months, lack of access to adequate health care, a contaminated water supply, a barely sufficient sewage system, trash-lined streets, and targeted Allied bombing raids. The refugees also had to contend with poverty, malnutrition, and health problems associated with a contaminated water supply. This said, refugee children were still able to attend school, adults could secure passes out of Hongkew to go to work, and the refugees were so vigorous in shaping their surroundings that by 1944, the main thoroughfare of Hongkew looked more like a street in Vienna than a bombed out section of Shanghai. In fact, the refugees created such a rich cultural life in Hongkew that, when some groups of refugees began to stage theatrical productions, other refugees penned editorials in refugee run periodicals complaining about the quality of said productions. Despite having forced the Jewish refugee population to relocate to Hongkew, the Japanese took no directly aggressive or violent steps against this population despite the urgings of their German allies. There are two reasons for this, both based in Jewish and Japanese isolation from each other throughout most of their respective histories. The first reason is that the Japanese formed a positive view of the Jewish people after private Jewish American financier Jacob Schiff funded their efforts in the Russo-Japanese War (1904-1905). Though positive, this view characterized the Jews as a wealthy, powerful people. Not long after, Japan fought alongside the White Russians in the Russian Civil War. The White Russians circulated the Protocols of the Elders of Zion amongst the Japanese troops, and when this document reached the Japanese government, that body saw it as a confirmation of their prior characterization of the Jews. The Japanese then enacted a policy of appeasing these people with such control over the Western governments. They thus refrained from abusing the Jewish refugees in their care. American troops occupied Shanghai in the immediate aftermath of Japan’s 1945 surrender. After a year or so of peace, the refugees once again found themselves in a precarious political position. The economy was failing under the rule of Nationalist leader Chiang Kai-Shek, and every day they received news of the progress made by Mao Zedong’s Communist forces. By 1949, the year in which Mao Zedong established the People’s Republic of China, most of the Jewish residents of Shanghai—Polish, German, Austrian, Russian, and Baghdadi alike—had fled to the United States, Australia, or Israel. By 1956, 171 Jews were left in Shanghai. A total of about 20,000 Jews (estimates vary) sought refuge in Shanghai. Others—though very few—made it to safety in such locales as the United States, Argentina, and Palestine. Many of the Jews who had fled Germany in the early 1930’s for other European nations ended up trapped in the late 1930’s, early 1940’s as those nations were invaded and occupied by the Nazis. Of the German Jews who escaped from Germany before 1941, only half of them survived the Holocaust. JEWISH-CHINESE CONNECTIONS, FASCINATING FACTS ABOUT JEWS AND CHINA. Within a few hundred years, the Jews of Kaifeng began to drift away from their religion. They intermarried with their Han Chinese neighbors and gradually lost their Jewish knowledge and traditions. When Kaifeng faced a devastating flood in 1642, its small Jewish community was able to recover and rebuild their synagogue. When Kaifeng was again heavily damaged by floods in 1841 – which wiped away the town’s sole remaining synagogue, among other buildings – the Jewish community never rebuilt. Today, Kaifeng still boasts a street called Nan-Xuejing Hutong, meaning South Studying-the-Scriptures Lane, where its Jewish community used to live. Few other clues remain of the once-bustling community of Jews that called China home. Data backs up Justice Kagan’s claim. Google records a noticeable jump in searches for Chinese Restaurants each December, and on-line delivery sites report receiving a “significant jump in sales” of Chinese meals on December 25. China is gaining an increasingly prominent role in kosher food production, too. It is now the world’s fast-growing producer of kosher food, with over 500 factories manufacturing kosher items. Star-K, a kosher certifier, reports that “China is fast becoming the frontrunner in all aspects of kosher food production” as more and more foods (including those that are kosher) are produced there. Chien His-chieh, the Executive Director of the Peacetime Foundation of Taiwan, has called for a radical change in the way some Chinese words are written. Specifically, she points out, the Chinese word for Jew, you tai, can be written with a variety of symbols – yet troublingly, the one used most often is demeaning, denoting dog or monkey. So far, Ms. Chien’s request has gone nowhere. It’s thought that the derogatory spelling originated at a time when Jews were considered extremely exotic or foreign to China. The Hebrew term for Chinese is less controversial: Sini. It likely originated with the Chinese Ch’in, the fourth dynasty of China, and is related to the Greek and Latin words for China (Sinai and Sinae, respectively). While a small Jewish community lived in Shanghai since the 1800s, Jews began to flock to that coastal city in the 1920s and 1930s, fleeing first from the upheaval of the Russian revolution, and then growing anti-Semitism in Europe. When the great powers, meeting at the Évian Conference in 1938, decided to block almost all Jewish immigration to their shores, only two places remained completely open to fleeing Jews: the Dominical Republic; and Shanghai (which at that time was governed separately from the rest of China). In the late 1930s, over 20,000 Jews called Shanghai home; by the time World War II broke out, Shanghai was home to more Jewish refugees than any other city in the world. After Japan’s invasion of Shanghai in 1941, Germany pressured Japan to murder the Jews in its control, even sending SS Colonel Joseph Meisinger (reputedly carrying a canister of Zyklon B gas with him) to Shanghai to advise various “extermination” plans. Japan resisted calls to murder the city’s Jews, but they did implement drastic new restrictions: Shanghai’s Jews were no longer able to receive aid money from abroad, and were crammed into the “Shanghai Ghetto,” more formally called the Restricted Sector for Stateless Refugees in the Hongkou District, where Jews were forbidden to leave. Even in these restrictive conditions, Jewish life in Shanghai flourished. Most notable was the Mir Yeshiva, a famous center of Jewish learning that relocated from Lithuania to Shanghai during World War II, and continued to offer classes. (Following the end of the War, the Mir Yeshiva moved to Jerusalem, where it remains one of the world’s premier centers of Jewish learning today.) Following the War almost all of Shanghai’s Jews left China for new lives abroad. Each year, hundreds of Chinese graduate and post-doctoral students flock to Israel’s universities to participate in the world-class research at Israel’s universities. In 2013, Tel Aviv University and Beijing’s Tsinghua University set up a joint high-tech joint research center, tapping into Israel’s and Chinese know-how to bring new innovation to medical technology and to finding solutions to pressing environmental problems. Interest in Judaism is rife in China. There are no fewer than ten academic centers of Jewish studies in Chinese Universities across the country, and students often spend a semester abroad, learning more about Jewish history and culture in Israel or the United States. Perhaps the biggest boost to knowledge about Israel’s academic life in China came from a recent game show Who’s Still Standing, a Chinese quiz show based on a popular Israeli program. When Hebrew University graduate student Lechao Tang appeared on the Chinese show in 2014, he did so well the show became the second-most watched program in all of China. Tang regaled Chinese audiences with descriptions of life in Israel, while the show’s hosts chimed in with a story of their own. On a visit to Israel they once placed a note asking for help in conceiving a child in the Western Wall – when they returned home, they told their audience, they had a baby boy. Trade between the Israel and China has skyrocketed: increasing over 20000% in the past two decades, to more than $10.8 billion today. After the United States and the European Union, China is now Israel’s third-largest trading partner. Providing scholarships to Chinese students studying in Israel, who do not receive scholarships from China. These students attend classes in Agriculture, Jewish History, Social Sciences etc. (some 10-12 students annually). Jim Ross, a long-time member of the Jewish Studies faculty and Executive Committee and member of the School of Journalism of Northeastern University speaks with journalist Benjamin Ivry about his research.